Sean Negrette claims the first ranking title of the 2018/19 youth season! The GDA once again wishes to thank each participant especially the ladies who turned up for this year’s edition of the Mixed Pairs & Trebles event. It’s the support of these individuals which is ensuring that the event is not lost forever, as the GDA continues its commitment to encourage ladies to take part. 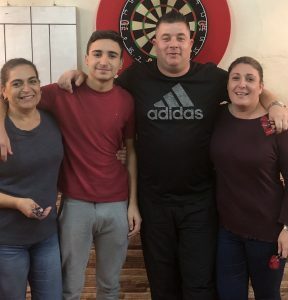 A excellent turnout of 10 pairs and 7 trebles turned up for this friendly night of darts. The night started off with the pairs event first. 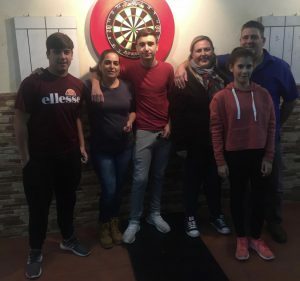 In the Preliminary Round we saw comfortable 2-0 victories for Dylan/Kayra Duo against Ibon Pachecho/Cristina Ruiz and Chris Dalli/Sonia Hermida against Keith Medhurst\Kyra Barea. In the Quarter-Finals Dylan/Kayra Duo defeated Chris Dalli/Sonia Hermida 2-0, Harry Parody/Noemi Reyes defeated Dylan Duo Jnr/Yvonne Duo 2-1, Justin/Ruth Hewitt defeated Julian/Stacey Tosso 2-0 and Christian/Chloe Tosso defeated Luie Gaivizo/Kacey Hermida 2-0. In the first Semi-Final match Dylan/Kayra Duo got the better of Harry Parody/Noemi Reyes with a 2-0 victory. The second Semi-Final was a tighter affair with Justin/Ruth Hewitt defeating Christian/Chloe 2-1. The final promised to be a great one as both pairs had been playing brilliantly all night. In the first leg Justin managed to hit a crucial 180 which set him up nicely to take the first leg on double 16. In the second leg after heavy scoring by both Dylan & Justin, Dylan managed to leave himself on a nice 52 finish to level the game. However, Justin managed to take out 141 in brilliant fashion to take the leg and the 2-0 victory! Congratulations to Justin & Ruth Hewitt, Commiserations to Dylan & Kayra Duo! The night finished of with the Trebles event. Chris Dalli/Sonia Hermida/Des Darlington received a bye into the Semi-Finals. In the Quarter-Finals Harry Parody/Noemi Reyes/Kacey Hermida defeated Ibon Pachecho/Cristian Pachecho/Cristina Ruiz 2-0, Dylan/Dylan Jnr/Kayra Duo defeated Keith/Keith Jnr/Kayra by the same scoreline 2-0 and in the final match Justin Hewitt/Ruth Hewitt/Sean Negrette defeated Christian/Julian/Chloe Tosso 2-0. In the first Semi-Final match Harry/Noemi/Kacey got the better of Chris/Sonia/Des with a 2-1 victory. In the second Semi-Final match Justin/Ruth/Sean defeated Dylan/Dylan/Kayra 2-0. The final only looked like it was heading one way and in the end that proved the case, Justin/Ruth/Sean’s power scoring was too much to handle and they won the game with relative ease and took the title with a 2-0 victory against Harry/Noemi/Kacey. Congratulations Justin Hewitt/Ruth Hewitt/Sean Negrette, Commiserations Harry Parody/Noemi Reyes/ Kacey Hermida!